At the first sign of symptoms, many people turn to the Internet for health advice. Early listeners to radio could turn their dials and receive health advice over the airwaves. 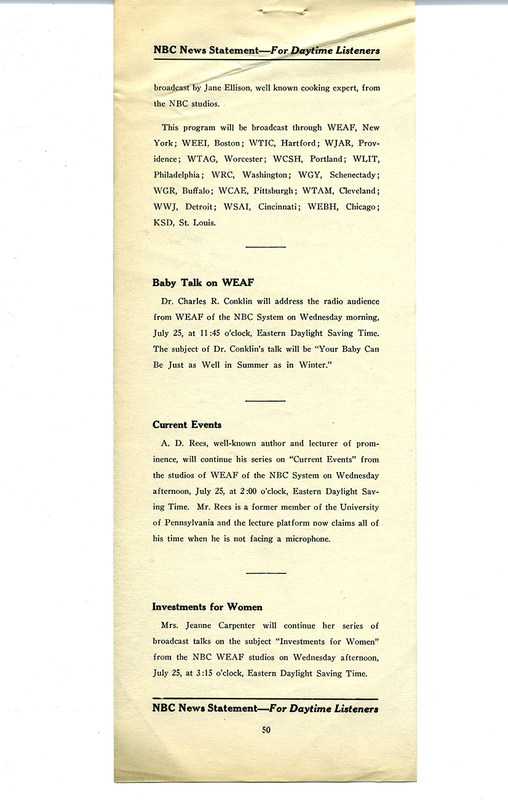 The museum holds a few dozen NBC radio guides from the late 1920s, the majority of them from 1928–1930. The network distributed these guides to affiliated stations so station managers could plan for the coming week. 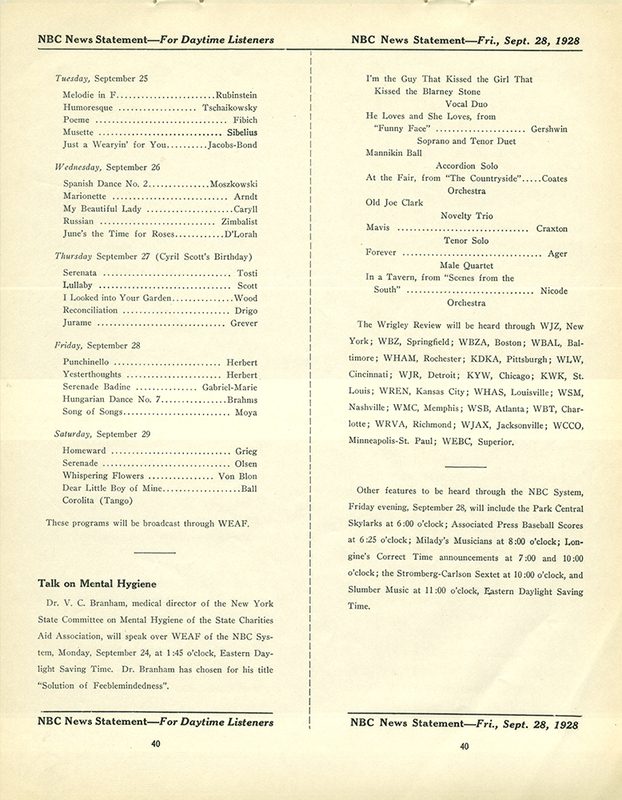 Managers used the information to inform local papers, solicit advertising, and schedule local shows. This way, the affiliates could coordinate the timing of local and network programming. While skimming the guides from 1928, three programs piqued my interest. Each covered a different health-related topic. Broadcast during the daytime, these programs found a niche among listeners. From caring for babies to mental health to cancer, there was something for everyone. On July 25 at 11:45 a.m., listeners to Baby Talk heard Dr. Charles R. Conklin (about 1874–1947) discuss how "Your Baby Can Be Just as Well in Summer as in Winter." Health-related fears for summertime included polio, as many people at the time believed the disease was contracted at public swimming pools. Other summer maladies Conklin may have mentioned included heat stroke or poison ivy. At 1:45 p.m. on September 24, Dr. Vernon C. Branham (1889–1951), a "medical director of the New York State Committee on Mental Hygiene of the State Charities Aid Association," chatted about a "Solution of Feeblemindedness"—definitely not a title that would be used today. Feeblemidedness and Baby Talk lasted fifteen minutes each. Dr. George T. Pack (1898–1969), on staff at Gorgas Memorial Hospital, talked for thirty minutes about the "Prevention of Cancer" on November 12. That broadcast really caught my eye because of how people talked about cancer differently at that time. Cancer was a subject people shied away from. Today's society is more open to personal discussions on cancer so it surprised me to see any show sharing information on what was mostly a taboo subject. These programs were all broadcast from WEAF in New York City and carried by other NBC affiliates along the East Coast. More than likely, the audience knew of these doctors. Dr. Conklin worked at the Children's Aid Society as a former director. Dr. Branham founded and edited the Journal of Criminal Psychopathology. Dr. Pack was associated with the International Union Against Cancer as its vice president. These topics may seem mundane and normal or even offensive by today's standards, but for listeners in the late 1920s the subjects and ideas presented might have quelled some fears or eased their minds. Reformers in the Progressive Era wanted to bring scientific knowledge to those who were more accustomed to folk medicine or homeopathic treatments. For WEAF in New York, there was a high influx of immigrants in the audience cut off from traditional sources of information. These doctors used the new medium to talk about age-old health concerns and to try to help people. While not a substitute for a doctor’s visit, using the airwaves to reach a wide audience helped these doctors alleviate or reduce anxieties among people they would never see as patients. Given that the guides listed so many various health-related programs, I believe they must have been popular with the audience. People in 1928 may not have had the instantaneous access to personalized medical information that we do but at least they could tune in for fifteen minutes of healthy talk. Connie Holland is a project assistant in the Division of Medicine and Science. She finds old radio programs fascinating and wishes recordings of these programs were available today. 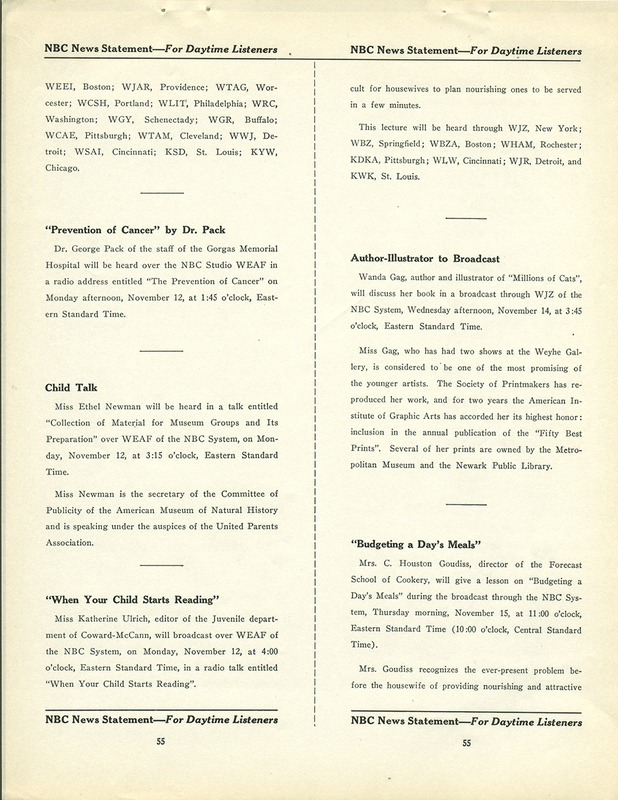 For more information on the NBC radio guides and their affiliates, check out her blog post on radio programming for July 4, 1928. Learn more about disability history in our EveryBody online exhibition and our polio website.